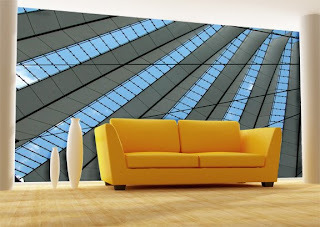 Some of the most interesting imagery you can use for a custom wallpaper project are architectural images. It can seem redundant to some, having a wallpaper mural of a wall put on, well, a wall. But as you can see from the picture on the left, there are some exciting ways to use architectural elements in your custom wall mural. A detail from a building can be even more interesting than an image of the structure as a whole. Much in the same way a satellite photograph reveals patterns and nuances one wouldn't see on ground level, an architectural detail becomes an abstraction of the original subject. Our sample image is a perfect example of this. There certainly isn't enough information going on in the image to denote its location, but there's more than enough visual interest to make this image a great candidate for custom wallpaper. The repetition of form and intersecting lines, matched with the slanted perspective of the shot provide the main thrust of the image, while the cool blue and gray tones support the overall look. Custom wallpaper projects based off of architectural elements can be inspired from around the world; think intricate scroll work at the Taj Mahal, or the swirling modernism of a Gehry project. Need more ideas? Contact us to begin your custom wallpaper project today!